When originally released in 1959, Sleeping Beauty was a major critical and financial disappointment for Walt Disney. The film cost a then-hefty $6 million and failed to break even on its original release in the U.S. Critics were unkind, too, calling it ponderous and lacking in memorable characters. Having just watched the digitally remastered 55th anniversary edition of Sleeping Beauty, I think the critics were perhaps a little harsh. While it doesn't rank with Disney's finest, it's still superior to most animated films. The only memorable characters are the three fairies--Flora, Fauna, and Merryweather--who become Princess Aurora's de facto parents. Dressed in bright red, green, and blue outfits, they dominate the story. Aurora, Prince Phillip, and even the evil Maleficent could have been better developed with more time on the screen. The plot is based on--but also simplifies--French author Charles Perrault's version of the fairy tale. Fairies Flora and Fauna bestow the gifts of beauty and music on the baby princess at a joyous celebration. But before Merryweather can give her gift, Maleficent appears and curses the child. She states that before the sun sets on Princess Aurora's 16th birthday, she will prick her thumb on a spinning wheel and die. Following Maleficent's departure, the King asks if the fairies can reverse the curse. Their magic is not strong enough to do that, but Merryweather changes Aurora's death to a deep sleep from which she can be awakened only by a kiss from her true love. The strength of Sleeping Beauty lies not with its narrative, but with its visuals. It was Disney's second widescreen animated feature film (after Lady and the Tramp) and the larger frame is filled with detail. Artist Eyvind Earle is generally given credit for the film's overall look. He won a 1953 Oscar for the Disney widescreen animated short Toot, Whistle, Plunk and Boom. However, Sleeping Beauty was undoubtedly the product of many gifted animators given the resources to create a visual masterpiece. I don't think the images below capture the vivid color and rich facets of the film. 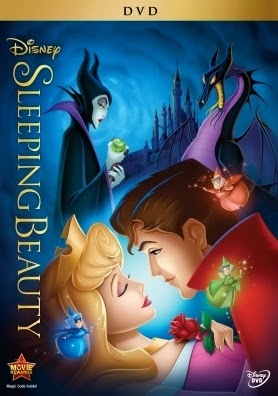 So, I encourage you to view a copy of the new Sleeping Beauty "Diamond Edition" DVD. Thus, I'll end this review here and let the pictures do the talking. The colorful Flora, Fauna, and Merryweather. Aurora walking in the woods. Note how the leaves are used to add depth. Maleficent--could she have influenced Cruella in 101 Dalmatians? With the reflection in the water, this looks like a painting. such as how the fire lights part of the tapestry on the wall. Expressionistic angles, especially the archway. Maleficent's castle--reminding me a little of the one from The Wizard of Oz. The dragon sequence is breath-taking--always the film's highlight for me. This shot reminds me of one used many years later for Disney's Beauty and the Beast. Sleeping Beauty is a glorious feast for the eyes. Combining the art with the music by Tchaikovsky continually draws my special needs son to the film. Subsequently, I have learned to appreciate its strengths while overlooking the deficits in the script. For those who haven't seen this in a while, they really should take your encouragement to watch the newer release. Love the breathtaking colors! This was an excellent way to write this blog - by letting the work speak for itself. Well done, Rick! I also really appreciated Caftan Woman's thoughtful comment. The testimony of children speaks volumes. I don't think I've seen this since - it was in release? Not sure. Unlike Snow White, Lady & the Tramp, Bambi, etc., this one hasn't gotten the repeat multiple viewings. The images are gorgeous. I'll have to watch it again. Love the classic Disney animated features. I've never seen this one, for some reason, so I'm glad to have read your review first. The images you presented truly are stunning, and I'll pay particular attention to the animation when I do see it. Thanks! I have a fond memory of waiting on line for a couple of hours outside Radio City Music Hall to see this when it first came out. I was in my senior year in an art high school and I was always a HUGE fan of the Disney staff of animators and background artists. They were magicians. I was lucky to catch this one during its last theatrical reissue (in 70 mm) in the late 70s / early 80s at a huge, single screen theater that was subsequently bulldozed. I was blown away. I've read Walt had pretty much checked out from the animation department by this time. Apparently the reality that he could no longer afford to create these films as lavishly as he wanted to killed his interest. Here though, his crew really stepped up to the plate and were ingenious about the modern style of the production as a way to look both thoroughly modern while economizing at the same time. For my money, the last great Disney animated feature.